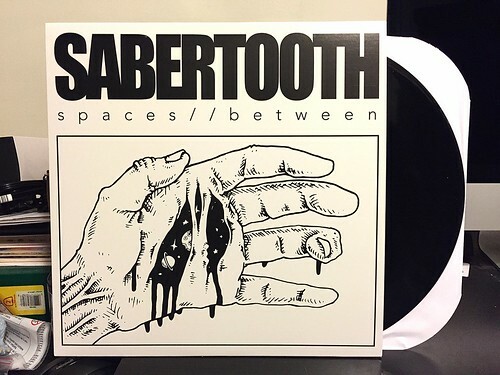 Sabertooth hail from Calgary, Alberta Canada, and just like fellow denizen Lance Storm I would make the argument that they are under appreciated for just how good they are. On Spaces Between, the band brings a hyper attack that's part Dear Landlord and part Plow United. I love it when bands are able to play really fast, loud poppy punk without the drummer having to rely on that crummy NOFX galloping drum beat. That's one thing that really sets Sabertooth far ahead of the pack, their drummer is simply phenomenal laying down tight rhythms with super dynamic fills and transitions. On top of that foundation, we've got some buzzsaw guitar riffing and impassioned gruff vocals. Throw in big hooks in the chorus and really, how could I not like this band. They're singing my song. A little blurb on the Debt Offensive Bandcamp page mentions that this could be Sabertooth's final release. I sure hope that doesn't end up being the case. Spaces Between is far too good to be anyone's swan song.